We have a bunch of mobile forensic tools. We have tools for extracting data from jailbroken iPhones and tools for decrypting password-protected backups. Tools for downloading data from iCloud and tools for analyzing user data mined by Google. We even have a tool for decrypting backups produced by BlackBerry 10, one of the most secure OS’es on the market. We also have a tool for viewing all that data. Elcomsoft Phone Viewer was initially released as a tool to complement our range of mobile forensic tools. Initially, the tool’s sole purpose was enabling our users to view information they extracted using other tools from our range via physical, logical or over-the-air acquisition. Viewing all but unencrypted iTunes backups would require you launching Elcomsoft Phone Breaker to remove protection and decrypt information. This is no longer the case. 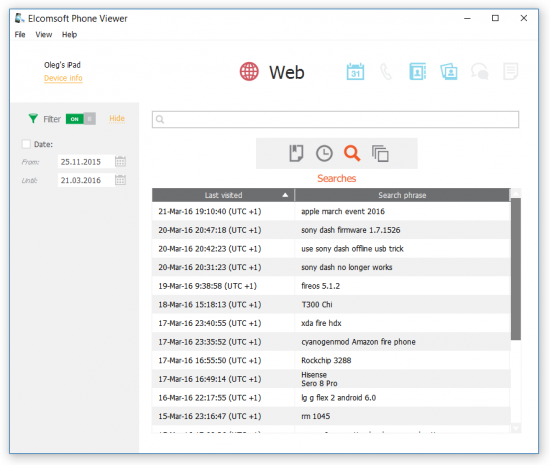 Starting with this release, you can use Elcomsoft Phone Viewer as a fully featured, stand-alone tool for accessing mobile data. What did we change and who can benefit from the new features? Read along to find out! 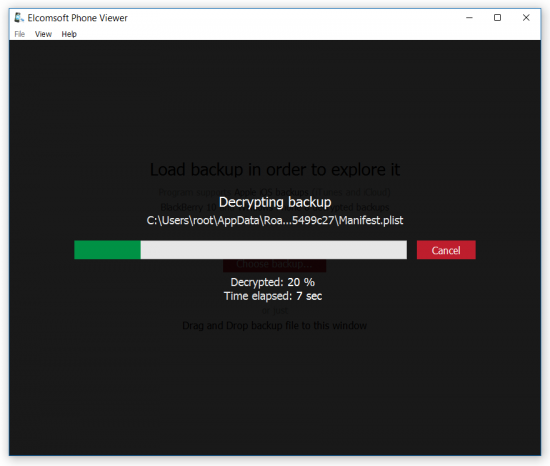 Prior to this release (which brings version number to 2.20), Elcomsoft Phone Viewer could only open unprotected data or backups pre-decrypted with other tools (e.g. Elcomsoft Phone Breaker). This limited its use, making Elcomsoft Phone Viewer a perfect companion tool but rather limited if you wanted to use it stand-alone. Version 2.20 adds a long-awaited feature borrowed from Elcomsoft Phone Breaker: the ability to decrypt password-protected iTunes backups all on its own. That’s right, you’ll no longer need to have Elcomsoft Phone Breaker installed if you want to open a local iOS backup protected with a password that you already know! 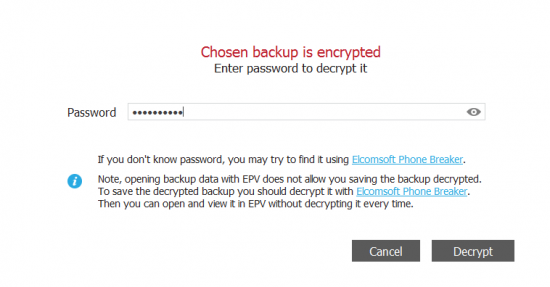 While breaking an unknown password will still be exclusive prerogative of Elcomsoft Phone Breaker, Elcomsoft Phone Viewer can save your time by decrypting password-protected backups all by itself. Who can benefit from this change? Everyone who just needs a tool to view a password-protected iTunes backup (and who happens to know the password). Everyone who needs to extract data from iOS backups without having to go overboard on fully blown forensic suites. Elcomsoft Phone Viewer is the perfect answer to those looking for an affordable tool for one-off jobs. In this version, we’ve also added a new Web plugin for iOS and BlackBerry 10 backups. 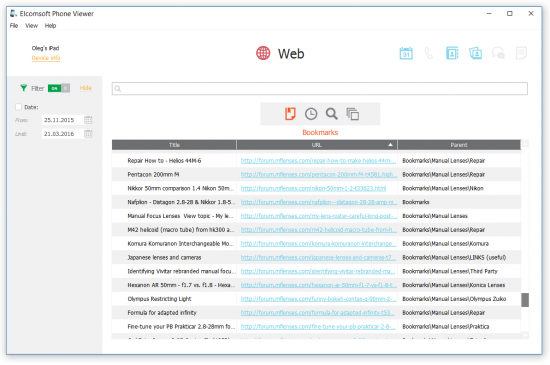 You can now analyze the user’s browsing history, search queries, bookmarks and browser tabs along with page snapshots. The ability to access the user’s latest online activities can be essential for investigations, while snapshots of opened browser tabs can often be the last available pieces of evidence to indicate that a certain Web page has been visited. Finally, the tool supports albums in iOS and BlackBerry 10 backups, both local and cloud-based. Images and videos are now automatically categorized into albums similar to those you see in iOS devices. When exporting media, the tool automatically creates a matching folder structure. This entry was posted on Thursday, June 23rd, 2016 at 10:35 am	and is filed under Elcom-News, Security, Tips & Tricks. You can follow any responses to this entry through the RSS 2.0 feed. Both comments and pings are currently closed.